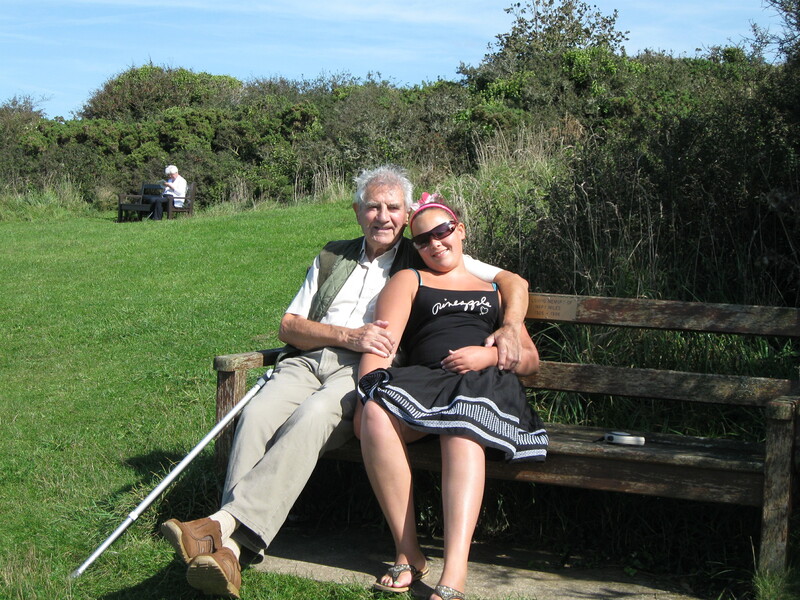 My dear old Dad suffered a stroke last week and subsequently has paralysis in his right arm. For such an independent and active soul this has been devastating but my Dad has borne it like a real trooper albeit a very weary one. We realise, of course, that we are so very lucky in comparison to others who have not been so fortunate. With the availability of various treatments, in some cases through rehabilitation full recovery is possible so we remain optimistic. It’s ironic but it’s the little things that you overlook when you’re in this situation such as forgetting that because my Dad’s right handed, he struggles now to wield a knife, peel a banana and open packets. It’s a big learning curve for us all but a challenge that we’re all up for. Whilst my Dad’s allotment and garden remains idle, on the upside I am chauffeuring him everywhere; although I’m not entirely sure he’s quite as thrilled about it! In fact, he’s remarked that whilst he escaped incontinence as a symptom, he may not be so blessed as a frequent passenger in my car. So if you’re reading this Dad, I want you to know that I’m proud of you and that I know you can overcome anything you put your mind to. Unfortunately, I subscribe to the Betty Davis style of nursing! Sorry to hear your news. I will think positive thoughts for your father and your family. So much can be accomplished with physical therapy. He completely agrees with you on that one! As soon as I read this post, I ordered him a stress ball on the internet so thank you for that! So sorry sweet peat. Never fun when parents get ill- that whole childhood fear of being left alone just comes sweepin right back like you were seven yesterday. And if it’s any comfort, I will not drive with my mama anymore because she won’t stop gasping and clutching the dashboard. I’ve never been a parent, but it seems like parents harbor an irrational fear that we’re out to kill them, specifically in a car. Ha! Well, as long as you promise to never run over Ted, I do still want to be your neighbor! We’re gradually getting back into a routine but it takes time but I have every confidence that he’ll be back mowing his lawn in no time at all especially with the added incentive of meeting you. Sorry to hear this Dallas. But glad things weren’t worse. Every time I dust my bookshelves I move three carved ebony elephants that were part of a vast collection my neighbour, Margery, had. She loved elephants. She was in her eighties but popped round as soon as we moved into our house back in England with details of rubbish collection, paper delivery and what-not, and firm instructions to let her know if we needed anything. I’d pop round for a cuppa sometimes, toddler in tow (always potentially terrifying in a childless house) and she’d open a tin and offer a chocolate while my eyes stayed glued to tiny hands that might smear the sofa at any given moment. We had some wonderful heart-to-hearts and she wrote to me when we stayed with family in Edinburgh while we had renovations done. My mother has also had strokes and each time she gradually recovers all her abilities given time. Best wishes to your Dad and I hope he makes a full and swift recovery. No way…he’s a natural, just needs to develop a sense of adventure! And a left handed outlook will surely help on that score! 😉 love to you BOTH! I’m so sorry to hear about your dad. I wish him a speedy recovery and lots of time with family. He says not only does he close his eyes when he’s driving with me but he’s saying his prayers as well. Just relieved to hear he’s okay. I’ll keep him in my prayers for a speedy recovery. That’s the spirit – and when he can’t, you must so he can. Bless you. The voice of experience dear. I’m glad if it helps. So sorry to hear about your father’s stroke – think I may be about his age (?) and gosh I’d be really frustrated in a similar situation – used to being so active and independent. Great you can be there for him. My parents lived to their early 90s but I was living far away in their later years and to this day regret not being able to give them more support. He says he’s seen your pictures and your far too glamorous to be his age! Happy BD to your dad! I’m sure you’re keeping him we’ll covered with hugs! He says its the medication which makes him oblivious to my driving! I am so fond of your dad even though I’ve never met him I feel like I know him from reading your fond and funny posts about him. Hopefully he will putting up shelves very soon. Wishing him a speedy recovery. Ah Dallas! I’m so sorry to hear about your dad (who happens to be one of my favourites in the blogging world). Your family is blessed with humour, commitment and love, which will make for a speedy recovery. It is not easy to see someone you hold dear go through difficult transitions, but these are the moments that give substance to the joy of being connected to people who care for each other. You will be in my thoughts…. Best he does and who will take my pictures! Oh, Dallas… I’m so sorry! This is what I mean about a big heart, with all you’ve going through, you still made time to show concern for me. You’re a kind person and deserve the best. So sorry to hear your news, but really glad your dad is doing well and keeping positive about it all. He sounds like an amazing gentleman with a cracking sense of humour. All my best wishes for a speedy recovery! My Dad loved your comment, reading through all of these has been really therapeutic for him and he’s laughed along with you all; secretly, I think he thinks this is his blog! Wishing your Dad a full and speedy recovery and thinking if you all. I’m very sorry to hear about the stroke but glad that your dad is being so well looked after. It must be a frightening prospect, having a stroke or having a loved one who has one. I hope the rehab’s going well, I’m sure a positive mental attitude helps a lot with recovery, and having a loving daughter and family around him will be a great boost. All the very best to him, he has lots of fans in the blogosphere who are wishing him well. So glad he is doing well. From what you have written about him he seems to be strong man with just the right attitude for recovery. Remember to take care of yourself as well as him! as you can see from all above comments, your dad is receiving lots of “positive electric virtual blessing and bits and bobs” from all your followers out in the blogosphere. Hope he will make a speedy recovery and back to the allotment soon where I am sure all his real (not virtual) pals await his return. Back to being a nurse for you… virtual hugs. I am so sorry to hear about your dad, and so glad that it wasn’t worse, and that he has you to help him through this. My friend Sharon suffered a stroke about three weeks ago. She lost the use of her left arm, left leg, and left eye. Luckily, she is right handed, and did not lose the power of speech, which would be especially hard on a storyteller. She is working hard on therapy three times a day, and can now move her left foot. Tell your dad that my husband’s aunt had a stroke when she was in her 80s, and regained the use of her limbs and lived to be 103. Wishing you all the best, and sending virtual hugs to you both. You’ve cheered him up no end reminding him he’s got another thirty plus years of my driving to endure! You had to learn your gift for facing what life brings your way with great courage from someone, I am guessing that is your Dad and that you will inspire one another in the days ahead. Praying for speedy healing for him and comfort for every heart that loves him. I am so sorry Dallas. That the stroke was mild is a good sign. R’s aunt too, completely recovered from a similar stroke that paralysed her left side and face, with the help of physiotherapy. From what I have read about your dad, I have no doubt he will beat this. Sending positive vibes his way. And to you and your mom. Love and hugs. How mean Dallas! 😀 Hoping you are proved wrong! PS: Does your mother read your blog? My WP Reader has totally changed (and messed up) how I look at and comment on other’s blogs and it is now not just difficult but close to impossible. Not sure what the problem is but if you don’t see me around for a while until this hopefully gets fixed, that’s the reason. Sorry. Really sorry to hear this news, Dallas. Best wishes to your dad, and all of you, during his recovery process. Thinking of you and your family this morning. Best wishes for recovery. I’ve been absent for a while but I’m so sorry to hear about your Dad. Prayers are coming your way for your Dad and family! It’s hard at times… this getting old. How luck he is to have a daughter always ready to supply cheap thrills. Your comment made him smile; I drove him down this really steep hill at the weekend and he offered to get out to walk and meet me at the bottom! It’s been a big learning curve for us all and we learn something new everyday whether good or bad; not sure he thinks he’s lucky to be chauffered around by me, sometimes when he’s clutching the car door as if his life depended on it, I think he’d rather walk!